Amora who flourished about the end of the third century, and who is frequently mentioned in both Talmuds. It seems that Ḥelbo was at first in Babylon, where he studied under Huna, the head of the Academy of Sura, and that, like the other Babylonian amoraim, he was called "Rab" (Ned. 40a). Later he settled in Palestine, where he was ordained rabbi. He is mentioned as having spoken in the names of Abdima of Ḥaifa (Yer. Ber. iv. 4) and of Ḥama b. 'Uḳba (Yer. Meg. ii. 3). In Palestine he consulted on halakic matters R. Isaac Nappaḥa (Giṭ. 60a) and R. Samuel b. Naḥmani (B. B. 123a). Ḥelbo handed down a large number of haggadic sayings of Samuel b. Naḥmani. Ḥelbo is mentioned in the Talmud as a teacher of ethics, his sayings being delivered in the name of Huna. Among them may be quoted: "He who goes out of the synagogue must not take long steps "; "One should pay great attention to the Minḥah prayer"; "He who enjoys the banquet of a bridegroom without gladdening the latter commits a five-fold sin" (Ber. 6b); "He who sees a torn scroll of the Pentateuch must rend his garment in two places" ("M. Ḳ. 26a). Ḥelbo also said, in the name of 'Ula, that he who sees the ruined cities of Judah must recite Isaiah lxiv. 9-10. In Gen. R. 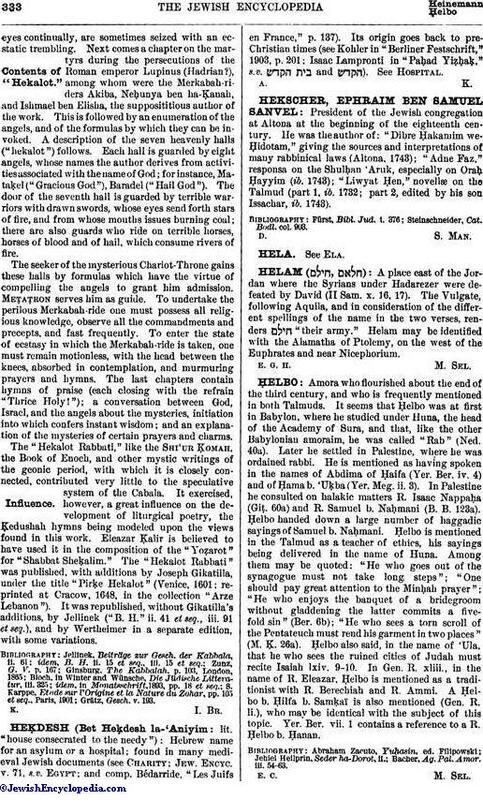 xliii., in the name of R. Eleazar, Ḥelbo is mentioned as a traditionist with R. Berechiah and R. Ammi. A Ḥelbo b. Ḥilfa b. Samḳaï is also mentioned (Gen. R. li. ), who may be identical with the subject of this topic. Yer. Ber. vii. 1 contains a reference to a R. Ḥelbo b. Ḥanan. Bacher, Ag. Pal. Amor. iii. 54-63.